Dr. Fabián Pina Amargós is a first-rate marine scientist from Cuba, who has worked closely with EDF’s Oceans program for many years. Fabián has been a scientist with Cuba’s Center for Coastal Ecosystems Research for twenty years and was recently named director of the center. Three years ago, Dr. Pina became the first Cuban to receive the coveted Pew Marine Fellowship and has used that support to expand his study of the majestic goliath grouper. Over the past few years, EDF scientists have been with Dr. Pina and his team on a series of research expeditions in the Gulf of Ana Maria and the world-renowned Gardens of the Queen National Marine Park to assess the health of fish populations and of the coral reefs and other marine habitats they depend upon. Because of Dr. Pina’s groundbreaking work, and his long history of collaborating with EDF and other marine conservation organizations in the U.S., Secretary of State John Kerry invited him to the history-making “Our Ocean” conference held earlier this week in D.C. The two-day meeting of minds brought together a diverse group of attendees from around the world to discuss approaches for eliminating marine pollution and addressing ocean acidification, as well as strategies for building sustainable fisheries. Many commitments were made by heads of state to designate protected marine areas including our own President Obama, who called for the creation of the world’s largest ocean preserve, potentially expanding the Pacific Remote Islands Marine National Monument to nine times its current size. While in the U.S., Dr. Pina also visited us in EDF’s Raleigh, North Carolina office and spoke with our intern Shannon Switzer. They talked about growing up in Cuba, how he became interested in marine conservation and his biggest hopes for Cuba and its people. See their conversation Part 1 of their conversation below, and learn more about this prestigious Cuban scientist and his work. The Caribbean Sea has a powerful ally in Fabián Pina Amargós. While many Cubans enjoy the beach, most remain where they can keep their heads above water, according to the native Cuban. Even as a kid that was not enough for him. He wanted to see what lie beyond the waves. Growing up in central Cuba, a young Fabián would visit his extended family scattered along Cuba’s coastline and spend long summer days salty and sun drenched-exploring, snorkeling, swimming and fishing. This youthful fascination with the ocean stuck with him through his undergraduate studies at the University of Havana, while he earned his Master of Marine Management at Dalhousie University in Nova Scotia, and as he conducted his PhD research at the University of Havana on the effectiveness of marine protected areas. While Fabián adores the sea and its underwater inhabitants, he’s also a pragmatist. He knows the ocean cannot be put in a vacuum and sealed off from human interaction, and is hopeful that promoting the sustainable use of the ocean’s resources will help protect it. This perspective has made him a perfect partner for the marine conservation work EDF has been conducting in Cuba over the last several years, and is one of the reasons EDF nominated Pina Amargós for the PEW Fellowship. Join me in Part 1 of our conversation as Dr. Pina shares insights into his homeland and how he first became involved with EDF. SLS: Before we jump into the meat and potatoes, where in Cuba were you born? FPA: I was born in Puerto Padre, a port in the north eastern part of Cuba. It’s one of the largest harbors in Cuba. It’s really big. So, I was born there and have relatives there, but I moved immediately to Ciego de Avila, which is my father’s hometown. That’s in the central part of Cuba, just the very center part of the island, and I’ve been living there for forty-two years now. Cuba is quite narrow so the shorelines are close, but still, it’s in the middle of Cuba. SLS: Since I mentioned meat and potatoes, what’s your favorite traditional Cuban cuisine? FPA: I really enjoy the traditional Cuban dish that is based on roast pig and congri, which is rice and brown beans. Also yucca- it’s like a root you prepare with garlic and oil. It was the staple of the first nation’s food in Cuba. You boil it, you can fry it and prepare it different ways. And for a typical salad we love tomatoes and avocados. It is very yummy. For dessert, Cubans love ice cream. SLS: Sounds delicious. Now to the meat and potatoes- how did you get hooked on the ocean? FPA: Well mostly for Cubans, vacation on the beach is the real thing, so every family tries to go to the beach for at least a few days. Since Cuba is very long but narrow—driving from Cuba’s north coast to its south coast takes maybe an hour and a half—almost every place is coastal. So, I have relatives in Havana, Cienfuegos and Puerto Padre and would go visit the different marine environments there. I love the countryside, but I really enjoy more the marine environment ever since I was a kid. We spent hours and hours at the beach swimming, snorkeling, fishing and just playing in the sun. We looked forward to the holidays and summer vacation, because we’d spend the entire school year in our cities, and then we had big expectations for spending vacations in the marine environment. SLS: Would you say many Cuban’s are tied to the ocean since it is so close on all sides? FPA: Most of the people enjoy the beach, but not in the deep waters. You see all the people in the narrow strip of the ocean that is below your neck. It’s not so many people you see beyond that depth. We are islanders but still we are not very very involved in the marine environment as a country, and the number of people living in the coastal communities is small. The population is not big beyond the large cities like Havana, Cienfuegos, Manzanillo and Santiago de Cuba- they’re the four largest cities in the coastal zone. They have beaches or harbors also. But the rest of the communities related to the coastal environment are small—a few thousand living there. SLS: Did any mentors in particular encourage you to explore beyond the shallow part of the sea? FPA: My parents and relatives from Puerto Padre. By chance I have relatives from both parents in that area, and many of them were sugar cane workers part of the year and then also part time fishermen. Especially my mom’s uncle, Paulino. He was the one that took me, my brother and the family for fishing, for having fun, for catching oysters and crabs. SLS: You’ve worked with the Centro de Investigaciones de Ecosistemas de Costeros (CIEC) for many years, and just recently moved to a new position. Tell me about that? FPA: I was a scientist at the CIEC and since a couple of months ago, I’m now the director. It is a big change, challenging, demanding but also fun. I’ve been with them since 1995, since I finished my bachelors in biology from Havana University. I have been working just in that place for almost twenty years. SLS: What marine conservation advances have you seen in Cuba since working with CIEC? FPA: The center was opened in 1991 and basically before that there was almost no information about the marine realm on the north-central part of Cuba, where CIEC is located on Cayo Coco. It’s the fourth largest island in the Cuba archipelago. Several island states in the Caribbean are smaller than Cayo Coco, so this is a big island. Since 1991, the center has gathered most of the scientific information that exists from both the north-central part of Cuba and the Gardens of the Queen in the south. So before that there was almost no data for these areas besides base line studies- you know inventory of the biodiversity, very basic type of research. The south part is where we have the most important ground for shrimp fisheries in Cuba, so there were some studies related to fisheries in the south. But beyond that, in the south we have done almost everything from general inventories through assessing the effectiveness of the marine reserve of the Gardens [of the Queen]—measuring if the declaration of the no-take zone plays an important role in conservation. From that to a study on structure of mangroves forest, seagrass productivity, migratory birds patterns and coral bleaching. And now we have the program for monitoring specific habitats in the area and have been tagging several species of fishes using several kinds of tags for detecting the movement of sharks, large fishes, game fish and groupers like the goliath grouper. We have also carried out environmental economic studies in the Gardens, like the valuation of the main goods and services of the area, such as the spillover of fish from the marine protected areas to fishing grounds. So most of the information that exists of the Gardens has the signature of CIEC, where we have done the whole thing or have participated in most of what’s been done by other institutions. SLS: I’ve heard some groupers can get to be the size of a Volkswagen van. What are the biggest Groupers you’ve seen? FPA: I have seen 400 pounders. There’s some information that there were 1,000 pound groupers decades ago. That’s the biggest that you heard anywhere, so probably people tend to exaggerate but at least I think they can reach 600 or 700 pounds. SLS: What challenges do you face doing marine research in Cuba? FPA: In Cuba we are not many people doing marine research and conservation so we are a multi-task team. For example, sometimes we carry out at least two kinds of research, because like with sharks and groupers you can do both at the same time. Typically for sharks we use long lines, we set the long lines for one hour and then we can repeat the settings two or three per day. But we can also leave set lines in the mangrove for goliath grouper, and that gear stays longer, so you can just set your lines and then go for sharks and then come back. So we use resources from shark projects and the goliath grouper project, and we put it together. And sometimes if we have a larger boat we involve the rest of the researchers, like for reptiles or birds, because that just adds a little more food, but we are still spending the same on diesel. For example on the expedition with EDF and CIM [in October 2013], sponsored by the Waitt Foundation, we did everything from [studying] terrestrial flora and fauna, coral reef health, connectivity and fisheries. In the same three or four weeks we were able to do several things. It’s one example that we try to do many things and take advantage of the resources that we have. And it’s perfect- PEW, EDF, everybody is happy, because we accomplish more things than just one narrow subject. SLS: How did you originally connect with Dan Whittle and EDF? FPA: I’ve been in contact with EDF since the beginning of the 2000’s, since other EDF staff were working with colleagues [of mine in Cuba], and I would chat with them during meetings. We started working deeply in 2009, after a meeting of the trinational effort in Havana that Dan and Denise [Stetten] attended. Since then we’ve been working with sharks and grouper, and my PEW fellowship was proposed by EDF, by Dr. Doug Rader. So that’s how I got my fellowship. SLS: Would you say the partnership with EDF and receiving the PEW Fellowship has helped you develop as a scientist? FPA: Yes, definitely. In Cuba we have the human resources—people are well prepared for doing work—but the resources are limited. We are a developing country struggling like other countries under the current economic situation in the world, but also we have the struggle with the US embargo—in Cuba we call it blockade—that prevents having a better relationship. But through the work with NGO’s like EDF, WCS [Wildlife Conservation Society], PEW, universities and research centers, like the Mote Marine Lab, we have been able to carry out expeditions with more people. Like, sometimes EDFers are coming to work with us, but mostly we have been able to get the gear that is needed that we cannot get in Cuba, because of our budget or these are tools that don’t exist in Cuba. 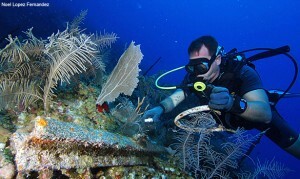 So we get those, and then we can carry out the research—research that is not only relevant for Cuba but also for the US and for other countries, because much of the results of our research can be extrapolated for other similar tropical ecosystems where there are coral reef, sea grasses and mangroves. Another thing is publication in very important journals, even being a part of books, like chapters and case studies in books. Also, participating in conferences in the US and other places—those things have been easier thanks to the relationship we have with US institutions like EDF, PEW and others. Stay tuned for Part 2 of the conversation, where Dr. Pina shares his opinion on the effectiveness of MPA’s and eco-tourism as conservation tools as well as his hopes for Cuba as a nation.